Purpose: Many treatments, such as conservative management or penetrating keratoplasty, exist for corneal wasp sting. Here, we report a case of paper wasp sting of the cornea treated by anterior chamber wash immediately following admission, which soon resolved the inflammation. Case: A healthy 9-year-old boy who had been stung by a paper wasp on his left eye 2 days prior to presentation at Dokkyo Medical University Saitama Medical Center was found to have corneal opacity accompanied by ciliary injection. The boy had difficulty opening his left eye due to pain. His left corneal endothelial cell density was 2,789 cells/mm2, which was relatively lesser than that in the right eye. We diagnosed a paper wasp sting of the cornea based on both the patient’s clinical findings and sting history. 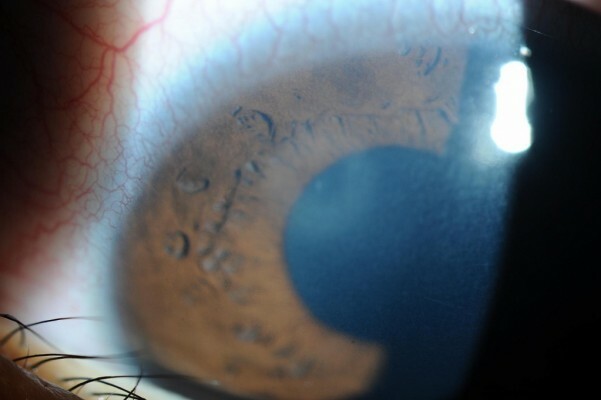 The anterior chamber was promptly irrigated using a balanced salt solution; the inflammation resolved in a few hours, and the patient could open his left eye easily the following day. One day after the operation, the visual acuity improved to 1.2, and only slight corneal opacity remained at the original wasp sting site. Conclusion: The positive outcome of the current case suggested that anterior chamber irrigation leads to rapid resolution of the inflammation.